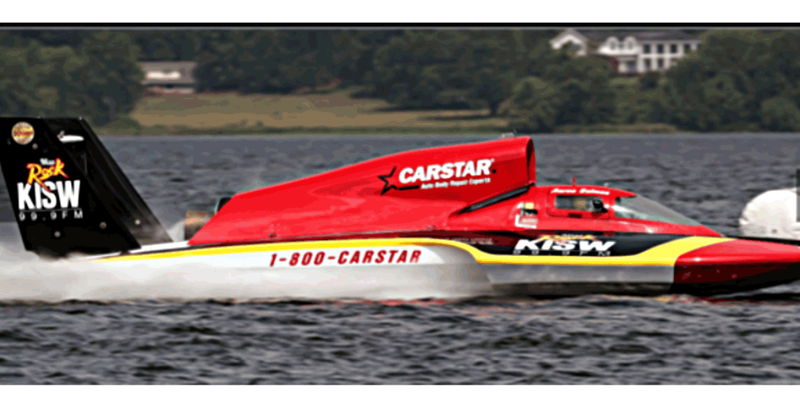 CARSTAR revved up the horsepower again this year by sponsoring a boat for the fourth annual season in the H1 Unlimited Hydroplane boat racing series. The CARSTAR Puget Sound Business Group continued the sponsorship of the CARSTAR Powered KISW 99.99 Miss Rock hydroplane with radio partner U-99.9, which is piloted by H1 Unlimited rookie Aaron Salmon. A former crew member for the U-11 J&D’s team, Salmon has been driving and working on hydroplanes in various classes for more than a decade. He’s an accomplished boat builder who recently completed a project for the Hydroplane and Race Boat Museum in Seattle. He connected with the CARSTAR team when the owner, Stacy Briseno, was looking for someone to repair the hydroplane after a 2017 crash. When he isn’t on the water, Salmon builds rockets for aerospace company Blue Origin, founded by Amazon’s Jeff Bezos, which is tasked with developing an affordable option for space travel. Salmon has had success in every series he’s raced — from tunnel boats to 1-Litres — setting speed records and posting wins at every level. Salmon spent six years crewing with the Unlimited Racing Group and working hand-in-hand with Raney, considered by many to be one of the best in the business. Salmon’s Unlimited Hydroplane is powered by a Lycoming T-55/L7 Turbine engine out of a Chinook helicopter. The engine produces 3,000 horsepower, and will reach speeds of 200 mph on the 2 to 2.5-mile oval tracks on which the series races. With two races on the schedule in Washington State, and with an event attendance of 150,000-200,000 spectators, it made sense for the CARSTAR Puget Sound Business Group to sponsor the boat. The race team, which was founded by boat racing legend Fred Leland, has had a solid season and continues to improve performance.